Automobile.com introduced a brand new feature that will allow users to compare the average annual costs associated with insuring almost any make and model. The cost averages are based on consumer vehicle insurance data through an exclusive commissioned survey. Each model is accompanied by a chart that breaks down the amount of coverage each policyholder carries. Coverage is divided into four levels: State Minimum, Basic, Standard and Superior. The chart displays the percentage of drivers that carry each respective level of coverage. For example, over 64% of Chevrolet Cruze drivers carry state minimum coverage compared to 41.3% of Ford Focus drivers, according to commissioned survey respondents. Users are then able to seamlessly compare insurance quotes or apply for coverage at this point. Another brand new site feature gives users the opportunity to browse customer statistics associated with each specific automaker. 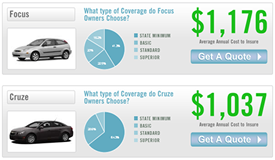 In addition to an overall coverage type breakdown, users can compare which insurance companies are the most popular with drivers of a specific make. For example, GEICO leads the way with Honda drivers, representing a 10% market share. State Farm is the most popular insurer for Cadillac drivers, enjoying a 9% market share. 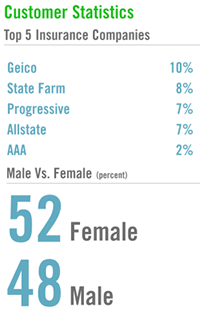 Users can also compare age and gender demographics for each automobile company. For example, 67% of BMWs are insured by men, compared to 33% insured by females. The average age of a driver insuring a BMW is 36 compared to an average age of 45 for Lincoln drivers. Additionally, credit scores and levels of education are displayed to give an in-depth look at the drivers of specific makes. Finally, the "most important factors" of insuring a specific make are displayed in a percentage list. Price, coverage options, customer service and "you don't care, you just need car insurance" are the four categories representing the important factors of insuring a specific vehicle brand. Automobile.com believes this information will make it easier for consumers to make educated decisions about levels of protection and types of coverage. Additionally, drivers will have a frame of reference and baseline when it comes to comparing specific rates across competing insurers or separate makes. The brand new comparison features are available for immediate viewing on each automobile manufacturer page. *Car Insurance companies typically display coverage amounts using three figures. For example, basic coverage ($50,000/$100,000/$25,000 or 50/100/25) would protect as follows: $50,000 in bodily injury liability for an individual, $100,000 for all injured parties in a single accident and $25,000 maximum for property damage liability in a single accident. Automobile.com is an independent auto insurance resource website. Automobile.com is not advertising on behalf of any companies listed or mentioned on the website.